The land of the Tibetan Plateau have carried the weight of a great number of Buddhist temples for a long time. 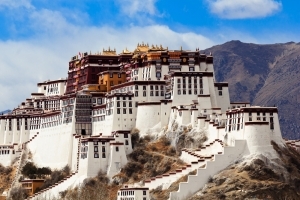 The gigantic temple complex and the royal Potala Palace are the best known – the centuries-old residence of the Dalai Lama. 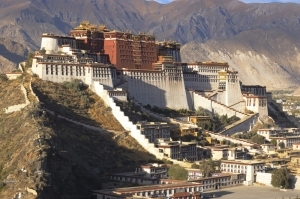 This magnificent palace erected in Lhasa at the height of 3,700 metres above the sea level is not only a palace complex with the highest altitude but also a real treasure trove of Tibetan culture and spirituality. 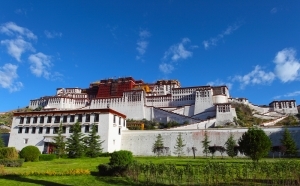 Transfixing with the multitude of majestic buildings and their unique interiors, the Potala Palace was added to the UNESCO World Heritage List at the end of the 20th century. Today the walls of this monumental and world’s biggest Buddhist temple enjoys a great popularity among tourists. Moreover, it is a holy place for pilgrims so it is very frequently used for organising important religious rites. The first temple on Marpo Ri (Red Hill) was erected a long time before the construction of the monumental Potala Palace being not only the Dalai Lama’s residence but also a Buddhist holy religious complex. As early as in the 7th century, in the times of Tibetan ruler Songcen Gampo – historians name the popularization of Buddhism in Tibet among his achievements, a temple was erected on this hill. The place for it was not chosen at random – according to legend there was a cave-monastery for bodhisattva Avalokiteśvara, a Buddhist deity, nearby the modern palace, and the Dalai Lama is believed to be his manifestation. Ruler Songcen Gampo loved to meditate in the cave, at his request the temple was erected in the 30s of the 7th century. Several years later, after the Chinese ruler agreed to the marriage between Songcen and Princess Wencheng, a huge construction started on the hill, as a result a real palace overlooked Lhasa. What can you see there? 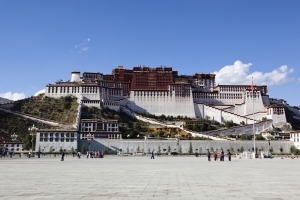 Not for nothing is the Potala Palace named one of the world's new wonders. It is impossible to name all the temples, treasuries, cultural and religious treasures which are located on its premises. Particularly noteworthy are the murals in the Dalai Lama’s rooms which were made specially for each of them in different years on the day before they took up the palace. It is noteworthy that these murals very often turned out to be prophetic, and the painted content predicted events that were to happen during the Dalai Lama's life. The Dalai Lamas' tombs are considered one of the most important temples in the palace, situated on the flat roof of the Red Palace and generously spiced up with valuables. Towering 10 metres above the palace roof, the tomb of wrought gold belongs to the 13th Dalai Lama who is buried here in a sarcophagus of pure silver. The biggest tomb-mausoleum belongs to the 5th Dalai Lama (who ordered to build the palace). It is located in the west part of the palace and it strikes with the artistry of ornaments made of pearls, turquoise, agates, and diamonds. The most spacious room in the palace is the Great West Hall which is surrounded by chapels on three sides. This hall, ornamented with wonderful murals, was used for the most solemn ceremonies and receptions in different years of its existence. A lot of pilgrims want to see with their own eyes the complex’s oldest rooms which have survived since the previous construction in the 7th century in the lower part of the palace. According to legend the dark chambers with walls of rough-cut stone belonged to ruler Songcen Gampo himself and his wives – Princesses Wencheng and Bhrykuti. 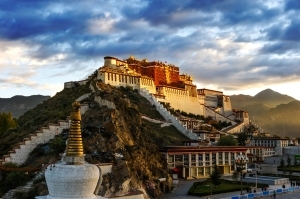 The Potala palace-temple complex has many stairs which you should not climb too fast not only because of the physical load but also because of the rarefied air, typical for the Tibetan climate. 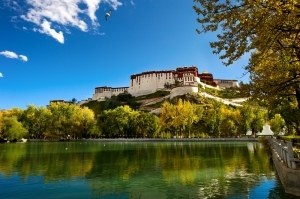 Also, you must remember that due to a great number of tourists and pilgrims the time for visiting the Potala Palace is limited only to one hour.